Western U.S. species commonly used for Christmas trees and windbreaks. Lincoln, N.M. seed source. A columnar shaped evergreen that is excellent for windbreaks and erosion control. Tolerates drought and infertile sites and is useful for wildlife food and cover. Maryland native. Generally 80 to 100 feet tall with a 24 inch diameter. Usually has a tall straight trunk free of branches on lower portions of the tree. Very important timber tree for construction framing. Also widely used for pulpwood. Grows on moist sandy soils and invades abandoned fields. Maryland native. Order in increments of 50 per species. (example: 50, 100, 150) Price listed is per seedling in group size you have selected. Price indicated in your shopping cart does not include the shipping fee. Shipping fee is 20% of the total dollar amount of your order or $25, whichever is greater in states touching Maryland. For other states shipping fee is 30% of the total dollar amount of your order or minimum of $25, whichever is greater. You will receive a separate order invoice for payment from the nursery, which will include the shipping fee. Shipping of your order will be March-April. Generally 80 to 100 feet tall with a 24 inch diameter. 10 to 15% increase in growth during its lifespan over 1st generation. Usually has a tall straight trunk free of branches on lower portions of the tree. Very important timber tree for construction framing. Also widely used for pulpwood. Grows on moist sandy soils and invades abandoned fields. Maryland native. This tree averages 80 to 100 feet at maturity. It has a tall straight stem up to 4 feet in diameter with branches commonly in whorls. They are usually planted for visual, noise and wind screens and favor fertile well-drained soils. Conifer best suited for the central and western parts of Maryland. Pitch pine grows up to 80 feet and is a Maryland native. Combines the cold hardiness and vigor of Pitch Pine with the size and moisture tolerance of Loblolly Pine. 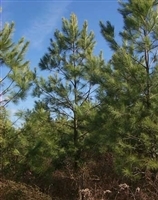 Shortleaf pine grows best on sandy loam to sandy soils with good drainage. It typically grows 60 to 90 feet at maturity. Maryland native. Grows in thick stands on dry or sterile soil. Retains lower branches when open grown and is commonly used for pulpwood. Grows 30 to 40 feet tall, with an 18” diameter. Maryland native. This tree averages 80 to 100 feet at maturity. It has a tall straight stem up to 4 feet in diameter with branches commonly in whorls. They are usually planted for visual, noise and wind screens and favor fertile well-drained soils. Maryland native. Copyright © 2013 Maryland Department of Natural Resources. All Rights Reserved.